I have been hitting the pavement on these blocks again and when I get these up to date, I will attack the DJ's provided I don't have a lot of 'surprises'. My MIL and FIL just arrived this morning for a 5 week visit. I know a lot of you are thinking 5 weeks!!!!!!????? ?It is okay, I will love the entire time they are here. They are very easy to have around and we always have a lot of fun together. Because they are here, however, my sewing time will probably be decreased significantly. 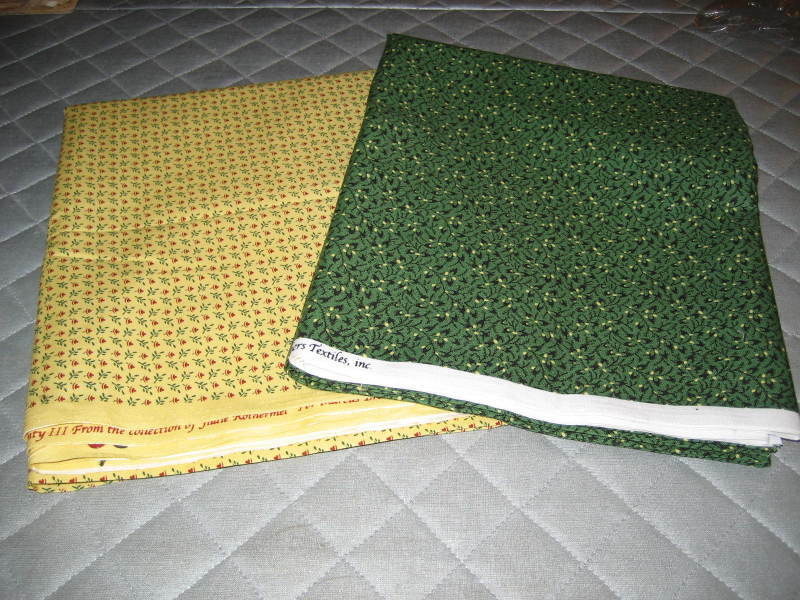 My friend Patty dropped off at my daughters house a little package to help me out with the Nearly Insane quilt and my inlaws brought it over in the suitcase. 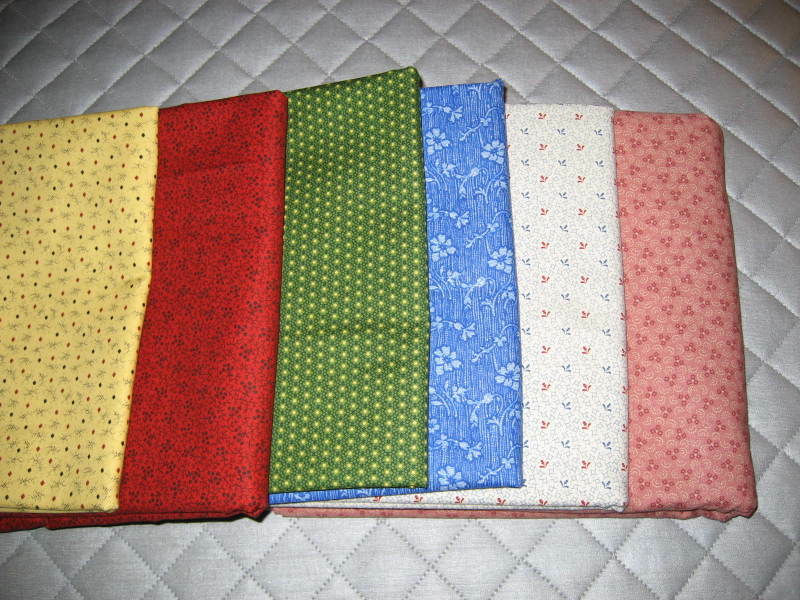 Patty said there were a few fabrics that will help with the NI project. They were so beautifully put into color groups and laid out so that they could all be seen. I can't believe this wonderful gift, I was so excited. 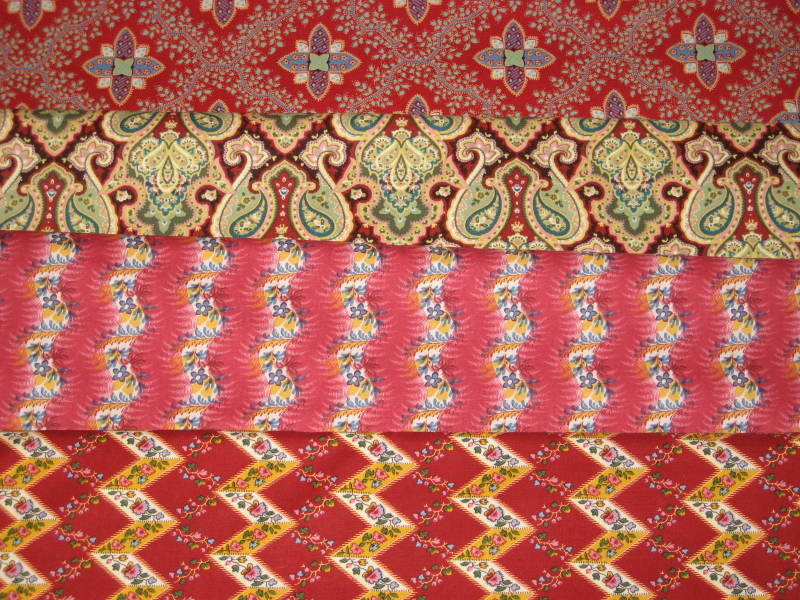 I have to share with all of you these wonderful colors and fabrics. Thank you so much Patty for this great gift. I am so excited to get to my next blocks, but as yet don't know when that will be. 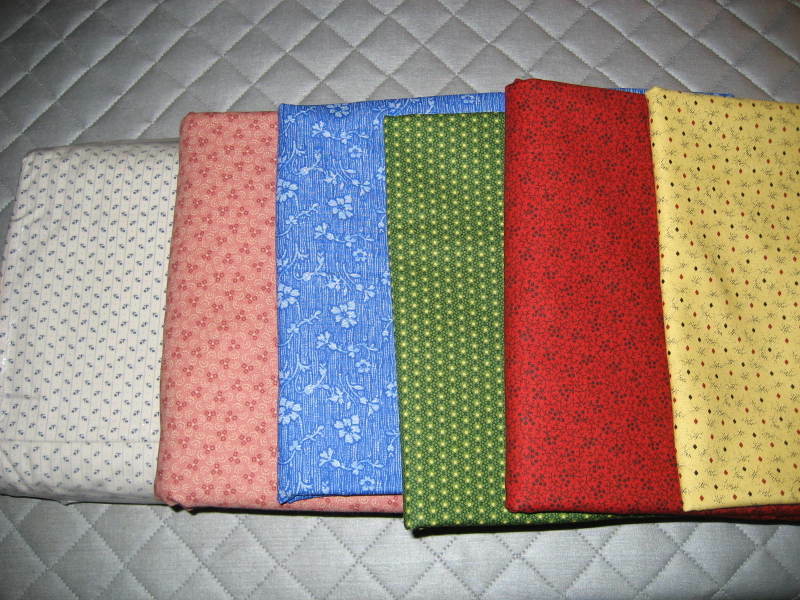 My husband arrived home this morning from the US with my border fabrics and a few books that I ordered. Unfortunately, the book I needed, Civil War Love Letters, was not there for him to pick up. The border fabrics were not quite what I had in mind. One was too pink, two of them were too busy, and the fourth might work, but I might just wait and see. You can never tell true color online when shopping for fabric. Oh well, I guess you can always use more reds. Someone once told me that red is a neutral. 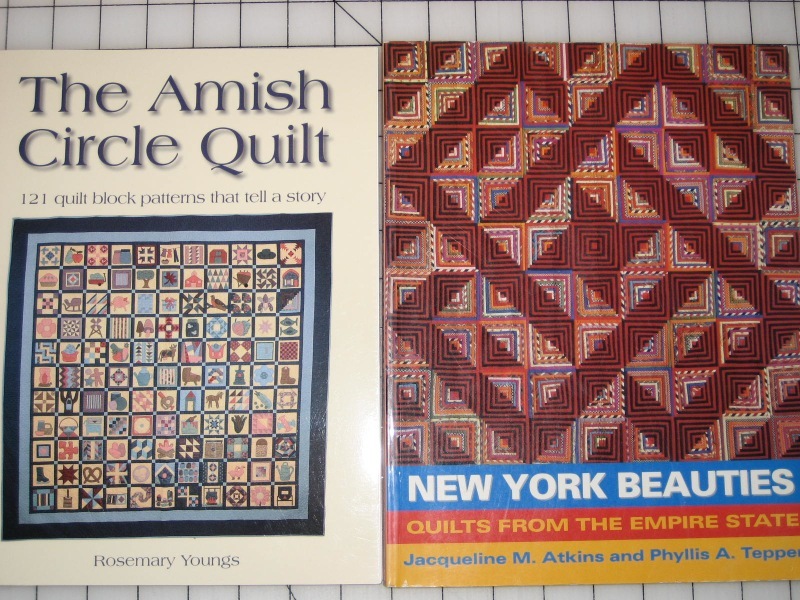 As recommended by Kathie, I purchased this New York Beauties book and I thought the Amish book might have some great ideas as well. 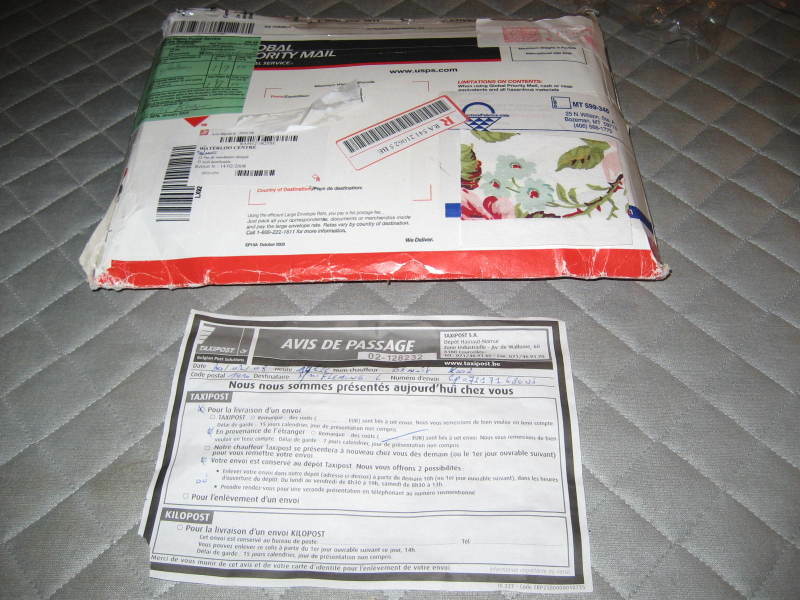 Today I received the package from Taxi Post that I had the frustrating telephone call with last week. 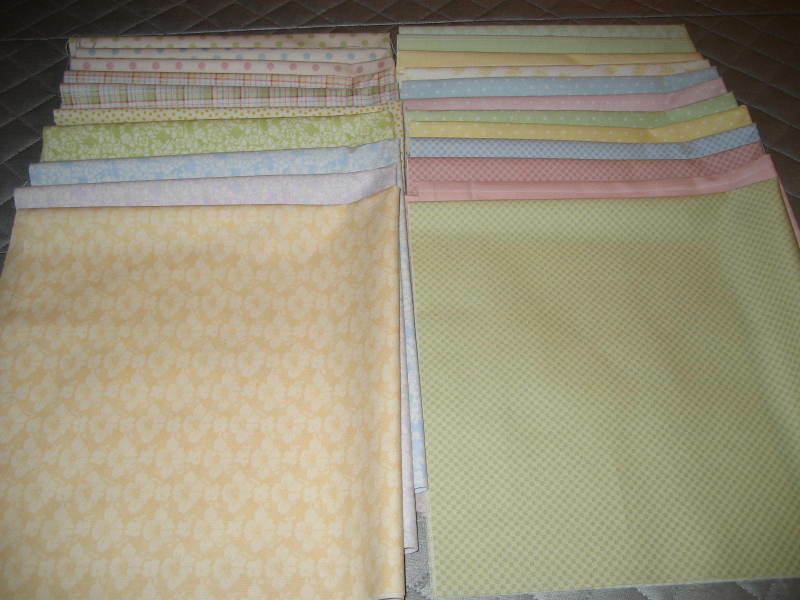 It was full of wonderful pastels from my friend Patty for backgrounds for our Lollypop quilt. We are officially starting this quilt now and we are all excited about it. It will be very bright and happy and I am sure that the process will take about two years. We are calling ourselves the Lollypop Girls. I also had another package come with the rest of my poison greens and crome yellows. I guess now it is time for me to get started on the green monster. 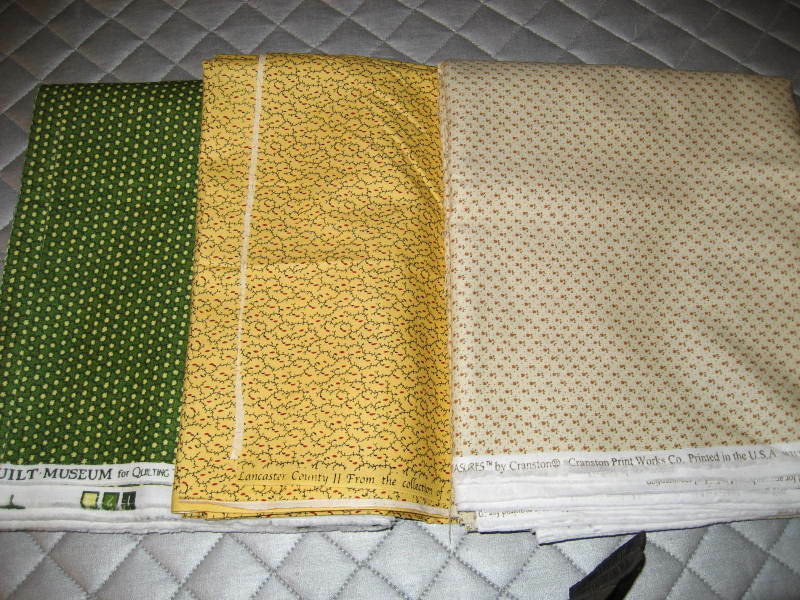 I have had this fabric for over a year now with intentions of making a blendy round the world quilt. It seemed there were always other things that needed to be done instead. 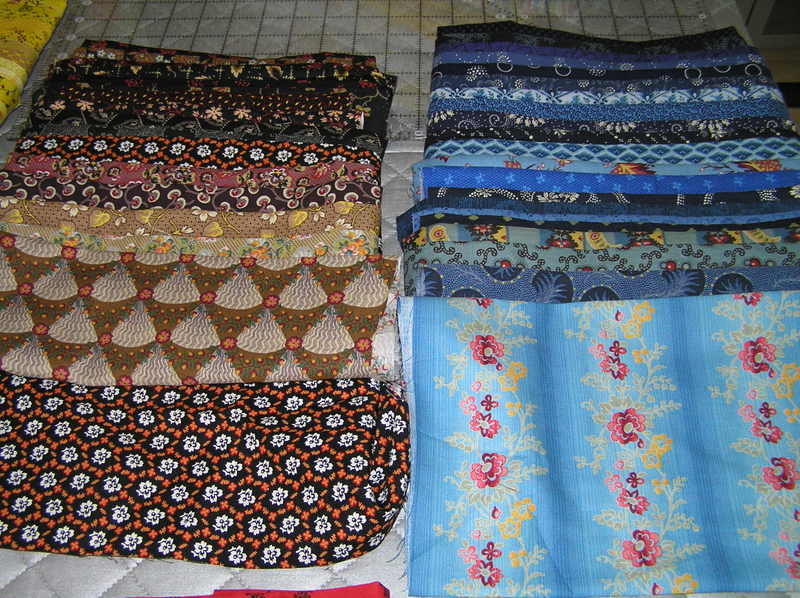 I have cut all of the strips 2.25 inches and there will be 27 squares out from center in all directions using the 20 fabrics. 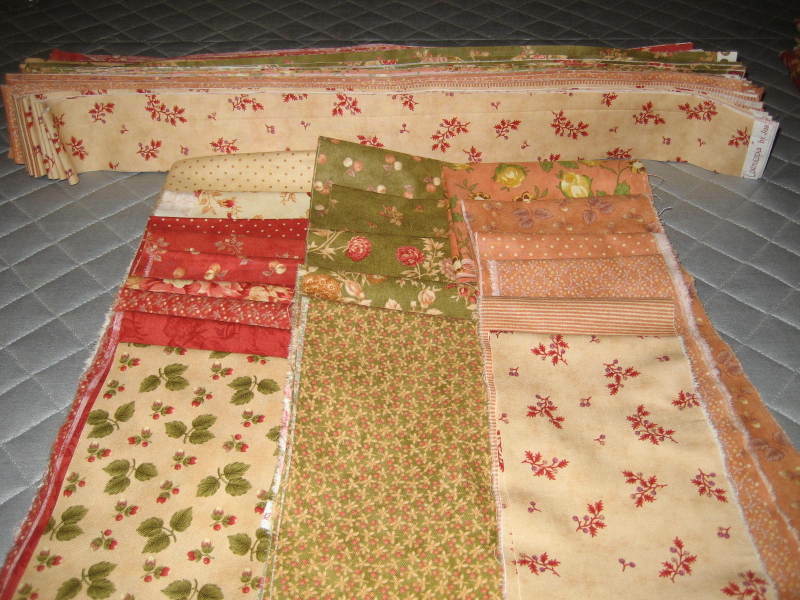 It will be a king size quilt when it is finished and I plan to put a very small red floral border to finish it up, but I really don't need to worry about that right now. I just returned from the Post Office and I feel extremely frustrated. I have to rant and rave for a minute, then I will feel better. Yesterday there was a note in my mailbox that I had a delivery, which I was very excited about, I might add. I was not allowed to pick it up until this afternoon. Today, there was another note in the mailbox from Taxi Post (which usually delivers boxes) as well. I might add I was extremely excited about that as well. I called Taxi Post and asked 'Parle vous Franscais?'. The answer is "No, desolee". Oh great, I have to try to ask these questions in French. So, I start in my very best, slowest broken French to explain that I received a thing in my mailbox and asked them how to receive my package. She said in perfect English, start over and say it in English. Why didn't she just start in English in the first place when I asked her. To make a long story short, I cannot receive my delivery until Tuesday next week. That seems a bit obsessive doesn't it? I asked, isn't there any way to get it sooner? "It is not possible". Okay fine, I guess I will have to wait. Next i drive to the post office and my son calls me and the alarm company calls me to say we have an alarm problem. Oh great. Anyway, it turns out fine, just a problem with the alarm and I will have someone fix it tomorrow. Then my son (23 years) proceeds to tell them that his car was broken into last night. They got his new IPOD, his new GPS (both replacements for Christmas from earlier break ins), his hockey skates and a lot of other miscellaneous things. He was extremely dissappointed because this is the fourth time he has had a car broken into in the last year and he went to the trouble to put everything in the trunk. We have donated 3 GPS's, 2 IPOD's, hockey skates, 4 coats (2 leather), 2 schools bags and a bunch of other stuff over this past year to the bad guys. After that phone conversation, I entered the post office to take my number. I was 310 and they were on 282. I was there for one very long hour just to pick up a package. If it hadn't been fabric, I would have just left!! Well, it was another piece of my poison green and another piece of yellow. Now I have no excuse to get busy on that quilt that Kathie and Patty have talked me into. Hers is almost done! I felt so negative when I returned home, I needed to vent. Thank you for listening, I feel better now. By the time I got home I said to myself, "if they told me we were going home today, I would be happy" Not a good attitude to have when you are living as a guest in another country. But, sometimes, it can be so frustrating to deal with things that don't seem like they should be so difficult. Thank goodness I don't feel like this all of the time. It was too many things that all happened in a short period of time that exploded into a huge frustration with the Belgian way. When I arrived home Wednesday, I had something in the mailbox written in French that basically said to go to the post office after 2pm on Thursday and give them money. 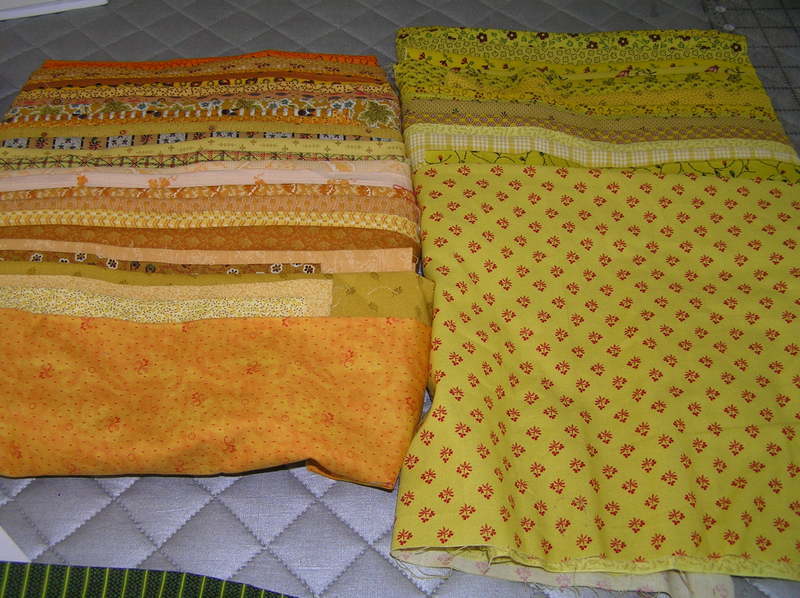 I suspected it must be some of the fabric I had ordered in Yellows and Green to make some of these quilts that Kathie has talked me into. I had the fabric vender put a very cheap price on the customs slip and I still got charged 10 Euro for each package. Man, I hate paying duty for fabric. It is still a lot cheaper than buying it here. It is between 15 and 20 Euro per meter (3" longer than a yard). I will be watching the mail because I should have two more of those packages coming with more greens and yellows. 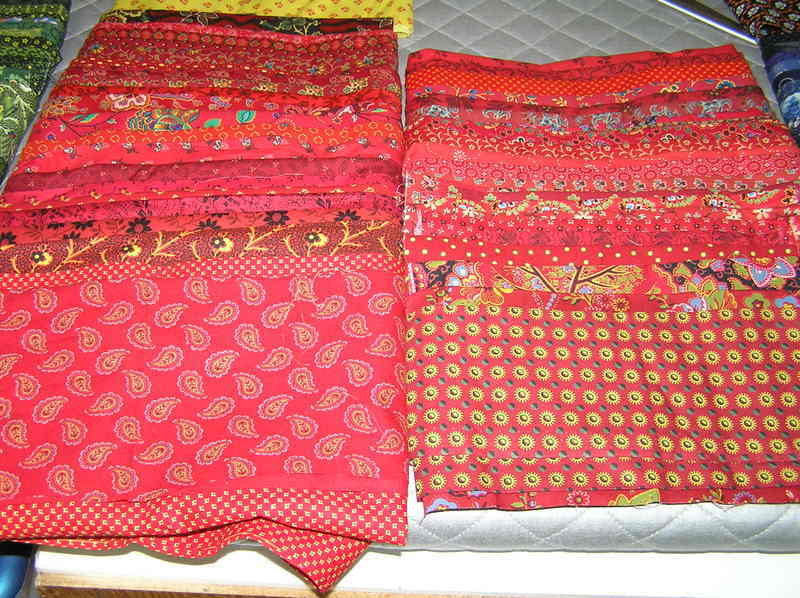 Hopefully soon, I can get started on that quilt that Kathie is nearly dpne with. I had decided to do the Carolina Crossroads a few weeks ago but didn't have time to start it. For me, it won't be a mystery quilt, but I still love the quilt and want to do it anyway. 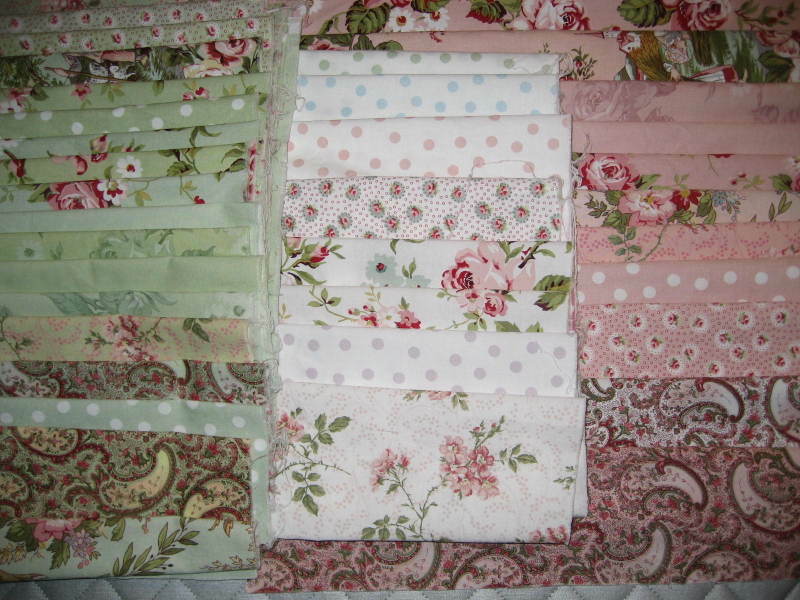 I had a bunch of FQ's of the Hannah Bella line that I bought at Market a few years back. I needed to use these up and what better project to do it with. I hope to start the cutting process tomorrow. I will keep you posted on my progress. The cleaning and organizing project is finished!!! It feels good to have accomplished that nasty job. I can now sew again. It is really hard to make posts on the blog when all you do is throw away things, organize things and give away things. As you have probably seen from Kathie's blog and Lucy's blog, there is a joint project going on and I have been reeled in. 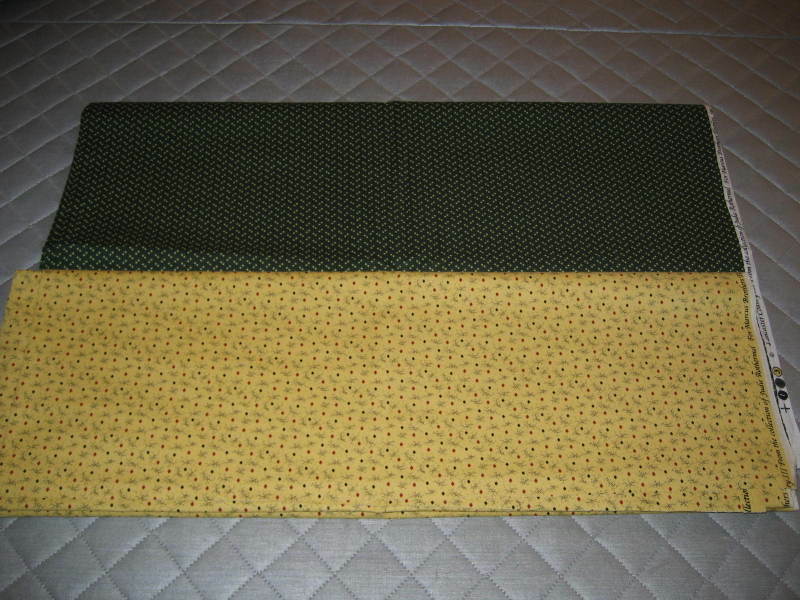 I have two sets of fabric choices and I am hoping that you all might be able to help me decide. The difference is the white/light fabric choice. Sorry I have been quiet for a few days, but I am practicing dicipline! I have taken drastic measures to try to take control of my life again. Lately, I feel like I have lost control of life, forgetting things and not being able to find things. I spend so much time in a day looking for things so I have decided to TAKE CONTROL. I have been cleaning out closets, drawers, pantries, cupboards etc in my entire house. I told myself I am not allowed to sew a stitch until I am finished. I still have the Master Bathroom, the office (would you believe that includes filing for about a year? ), and the basement. I am hoping to be able to sew my first stitch by Wednesday. Yesterday, I allowed myself into the sewing room to cut up jeans that I was disposing of. I figured it was part of the organization process, not sewing. 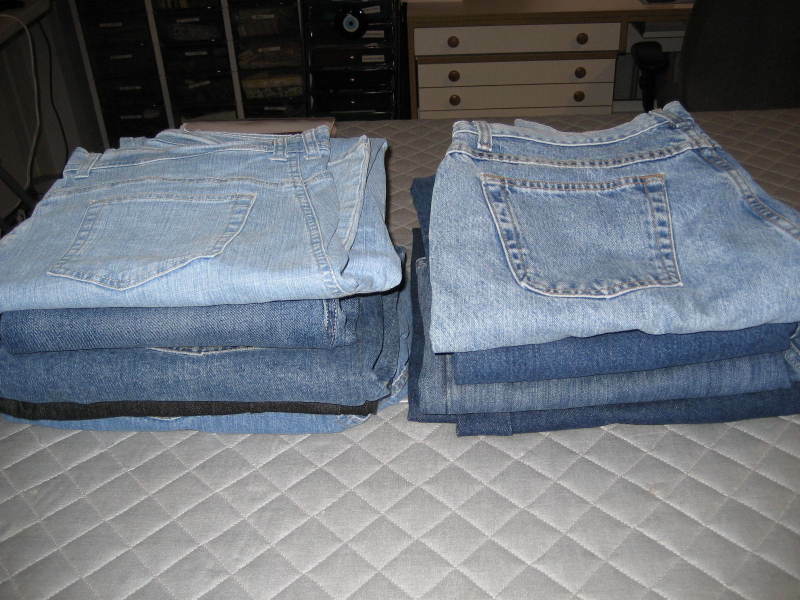 I had a large pile of jeans to start. 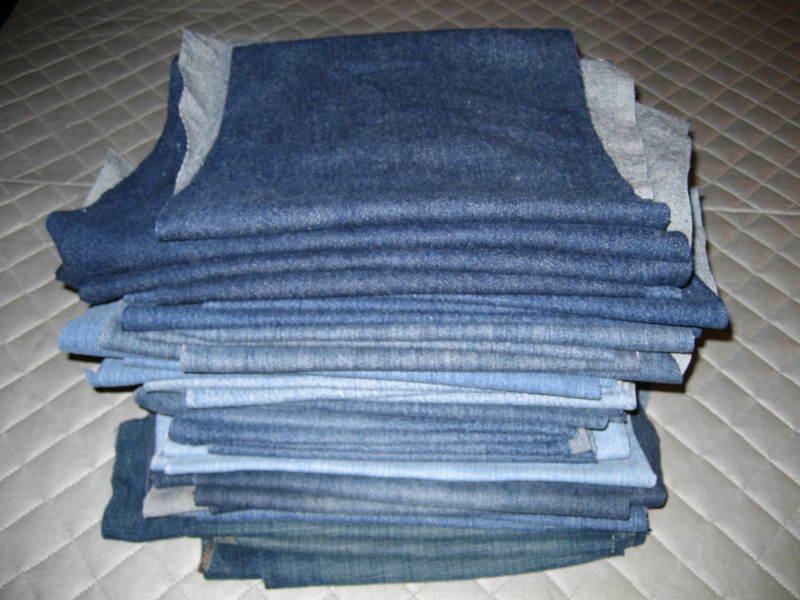 I have now cut all of my old jeans so that when I am ready to start a jeans quilt, I am ready to go. I have another pile from before about the same amount. 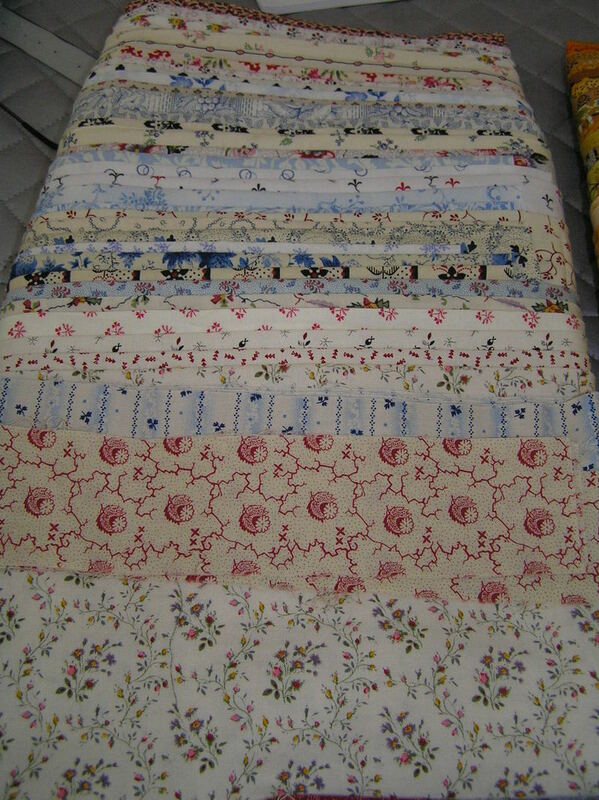 I am sure there is enough for a very large pieced quilt with a pieced back. 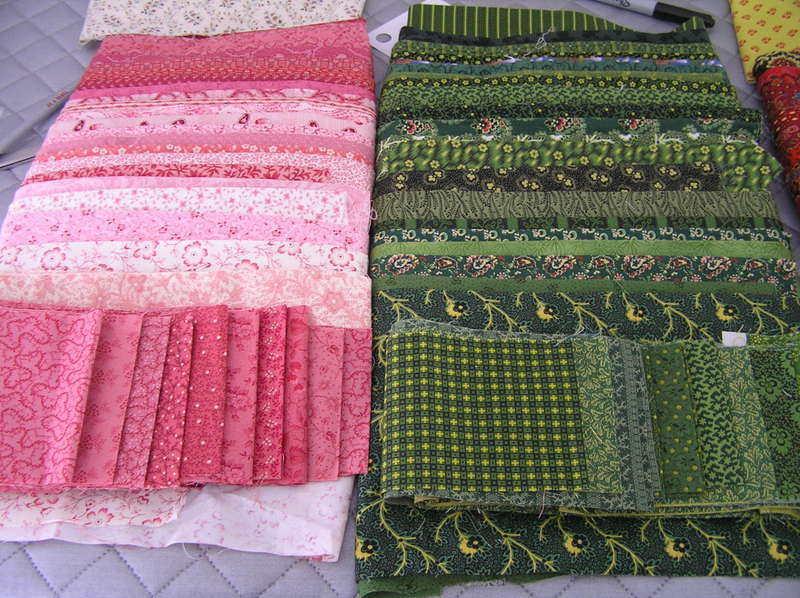 Thank goodness I am not hand piecing and handquilting that one! !